Heading to the range? 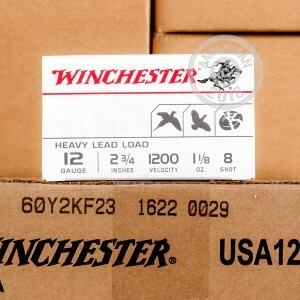 This 100 round value pack from Winchester is a great choice for busting some clays. These Heavy Game & Target shells are 2-3/4" and hold a 1-1/8 oz. payload of #8 lead shot. 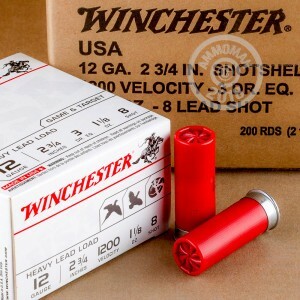 These also make good shells for hunting upland birds, just make sure lead shot is permitted. 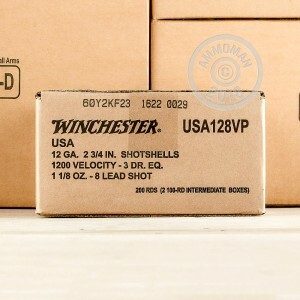 Winchester has earned the reputation of providing high quality ammunition at reasonable price points. After 140 years, they are one of the leading ammunition manufacturers in the world. Their ammo is made in the USA in Alton, Illinois. If you plan on shooting all day, stock up and save more. AmmoMan.com offers free shipping on all orders over $99! Worked just fine with no failure to cycle of any kind. Great stuff.